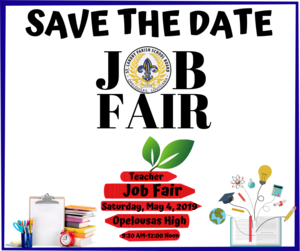 Click on the link above to view all PreK-4 and 5-6 Opelousas Elementary Schools zone maps. Magnet Academy for Cultural Arts is now accepting applications. You can download the application form by clicking on the link above. • All applications must be completed and returned to the school by Friday, April 26, 2019. *Click on the Educator Academy to view offerings and register. Congratulations to Amy Dartez, a senior at Beau Chene High School, for being named by the Louisiana High School Athletic Association (LHSAA) as All-Academic Girls’ Track and Field Honoree for 2018-2019. She will be honored at the State Track and Field Event in Baton Rouge on Saturday, May 4, 2019. 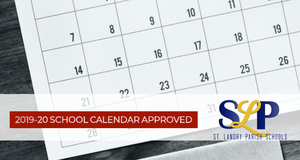 Click on the link to view the approved 2019-2020 St. Landry Parish School Board district calendar. Click on the link for information on how to apply. SEMI-FINALS -at Burton Coliseum, Lake Charles,LA. North Central High defeated Logansport High by a score of 78-38 on this past Friday, March 1, 2019. They will play Jonesboro-Hodge High School on next week in Lake Charles, LA. North Central High vs. Logansport High at North Central High on Friday, March 1, 2019. (Quarterfinal Round) @ 7:00 PM. Admission is $10.